Soak Spa & Foot Sanctuary’s Monthly Wellness Spa Membership is a program designed for those seeking to embrace wellness, immerse themselves in relaxation, and find tranquility without being locked into a long-term commitment. We offer three programs for guests to customize their ideal Soak Spa & Foot Sanctuary experience. All service times reflect the true hands-on time of your session. Our selection of holistic spa services begin with being served our signature ginger tea and a light snack. Robes and sandals are provided with our spa packages and foot treatments in our Foot Sanctuary. Treatments include aromatherapy inhalations, scented rice/flax packs to relax sore muscles, warm foot booties with every facial, and feet are wrapped in hot towels to conclude your spa services. Monthly Wellness Programs are auto-charged to a credit card monthly, on the date corresponding with the date of the initial agreement. This information is kept securely on file for future transactions on the customer’s account. Wellness Program services are available Monday-Saturday, based on availability. Wellness Program prices cannot be combined with any other offer. One unused service will roll over and may be redeemed during another month. Customer has the option to freeze their program for up to 60 days; if program remains frozen for more than 60 days, this will constitute a cancellation. If the Wellness Program is cancelled, any unused services may be redeemed for 60 days following cancellation before the offer expires. Soak Spa Shop, LLC reserves the right to charge one final payment to the Monthly Wellness Program member’s credit card on file and agrees to cancel the signed agreement with 10 business days of the “Date of Cancellation Request” applied to this form. This contract can be cancelled within 3 days after the date of signature. You may do so by notifying Soak Spa Shop, LLC in writing via email or mail within the 3 day time period. Any payments made prior to cancellation will be refunded to you within 10 days of notification. Notice to cancel Wellness Program must be given in writing, using the Cancellation Form available at the Spa or Spa website. Cancellation will be effective 30 days following notice to Soak Spa Shop, LLC. As a Wellness Program customer, you may cancel at any time or for any reason. Cancellation of the contract may also occur under the following conditions: death or disability of the customer, permanent relocation of more than 50 miles from the Spa location, or Soak Spa Shop, LLC going out of business. This cancellation will relieve customer of any obligation of said contract. Wellness Program’s 15% off additional services may not be used on Face Reality Acne Treatments, Monthly Specials, Spa Packages or on any other services that are already discounted. The 15% off additional services may only be used on full-priced services received by the membership holder. Deep Tissue may be added to any level of massage program for an additional $10 per service. Hot Stone Full Body may be added to “Submerge” or “Saturate” level massages for an additional $20 per service. Neither the Deep Tissue nor the Hot Stone Full Body qualify for discount. 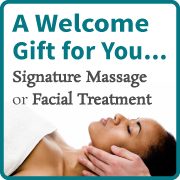 One gift certificate may be purchased per month for $65 ($80 value) to be redeemed for a 60 minute Signature Massage or 60 minute Signature Facial by a friend or family member. No enhancements are included in the gift certificate purchase. Gift certificates are valid for one calendar year before expiring.